in sliding friction. Something really exotic [is] going on." A new and unexpected characteristic of superconductors, first observed in 1998 research at Northeastern University, has now been confirmed. 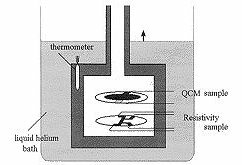 Jacqueline Krim, Professor of Physics at North Carolina State University, reports the coefficient of friction drops by almost half in tests on ultra-thin, ultra pure samples of lead operating below its superconducting transition temperature when slid across frozen nitrogen. In Krim's work a delicate quartz microbalance with lead substrate is moved back and forth about 10 nm at rates of a million times per second. With this technique Krim's team measured what are probably the smallest frictional shear stresses yet observed - excepting for superfluids, which exhibit no friction at all. According to Krim, "There was much initial speculation that the effect had nothing to do with superconductivity at all - that it was just a phase transition in nitrogen. There was also speculation that the effect would reveal a surface transition temperature for superconductivity that was different from the bulk transition temperature. We spent some time carefully checking out the aforementioned suggestions, and found the change in friction to be exactly tied to the bulk transition temperature." Despite the billion-dollar industrial importance of friction, it is still poorly understood. In Krim's proposal to the National Science Foundation she states, "There appears little relation between the friction and the fraction of electrons in the superconducting state. A leading theory of superconductivity-dependent friction by Bruch predicts that the effect will be highly influenced by the polarity of the adsorbate. We propose to investigate adsorbates that are more (CO), and less (Ar) polar than N2, to determine whether they will exhibit greatly differing sliding friction effects." A newly observed type of surface tension unique to superconducting particles was noted by a team of Southern Illinois University (SIUC) physicists in 1998. But, it is unknown if this is related to that phenomenon. As Krim puts it: "Most of the ordinary theoretical explanations appear inadequate and we are left with something really exotic going on."